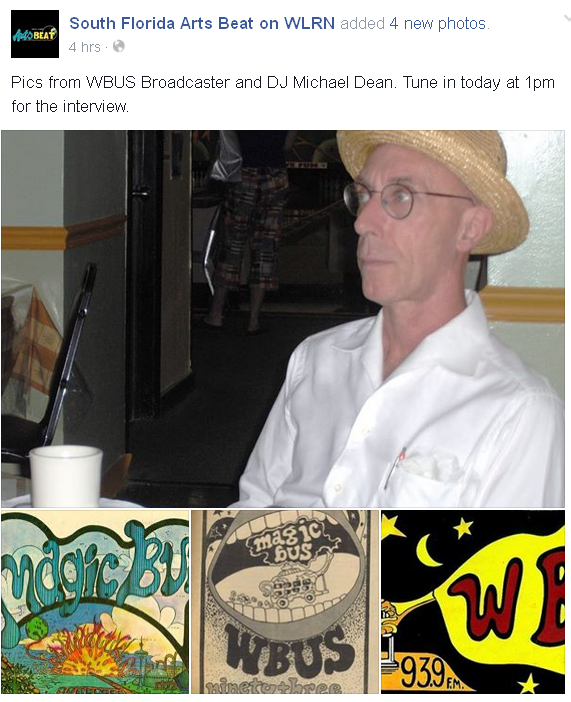 05/29/15 - Next time on South Florida Arts Beat, legendary record man and broadcaster, Michael Dean, previews his Lincoln Road Listening Club presentation about WBUS, Miami Beach’s alternative radio station of the early 1970s. Renowned actor, producer and writer, Sam Elliott, talks with our film critic, Dan Hudak, about his latest film, “I’ll See You In My Dreams”, and his long cinematic career. Chef Norman Van Aken and Jody Horne-Leshinsky’s Broward arts calendar wrap up the show. Catch the conversation and information every Friday on South Florida Arts Beat at 1:00pm. 05/22/15 - Next time on South Florida Arts Beat, Dr. Jordana Pomeroy, Director of the Frost Art Museum at FIU, describes to contributor, Judith Bishop, new exhibitions coming to the museum through the fall. Charles Greenfield previews future concerts from the Mainly Mozart Series with Artistic Director Marina Rah-DU-shina. Jazz and Blues writer, Bob Weinberg reviews “Brandon’s Blues”, a new CD from South Florida’s Blues legend, Joey Gilmore. 05/15/15 - Next time on South Florida Arts Beat, you can enjoy another exciting studio performance. One of the greatest names on violin in European Jazz comes to Florida to continue his stateside career. Catch the magnificent talents of Vitali Imereli as he performs with his superb trio. A protégé of the legendary Jazz violinist, Stephane Grappelli, Mr. Imereli is poised to become an international Jazz star.